[description] => Our Duraglaze Plus range is one of the most competitive Flush Glazed rooflight products on the market with the benefit of having a base kerb for direct fixing to roof level. The range offers a sleek modern design which is Part ‘L’ compliant. Extruded from high quality UPVC this range offers an integrated water management system to shed water to the outside of the rooflight. Internally the white UPVC provides a clean, smart self-finish. The Duraglaze Plus glass rooflight with kerb offers a ribbed section to the upper segment of the external wall to give improved adhesion to a variety of waterproofing systems. It is manufactured using a state of the art CNC manufacturing process, which guarantees accuracy and consistency of each unit produced. Designed to be installed at the finished roof level, it is the ideal choice for retrofitting to an existing flat roof. Our kerbs start at 168mm high, where the splays in from the base section measure 100mm per side. The 60mm base fixing flange allows fixing to flat or inclined roof structure. The U-value for this profile is 2.05 W/m²K. Duraglaze Plus uses a minimalistic perimeter UPVC carrier frame, the glass is bonded into this frame in a factory controlled environment to give a flush glazed appearance. This range can be used with a variety of double glazed glass options, as standard a 6/16/6.4 (28.4mm) low emissive clear glass is provided – please contact the office on 01670 821 166 for non-standard options. We also offer Vented or Hinged rooflights where ventilation is required and Access Hatch Units for a limited number of sizes. 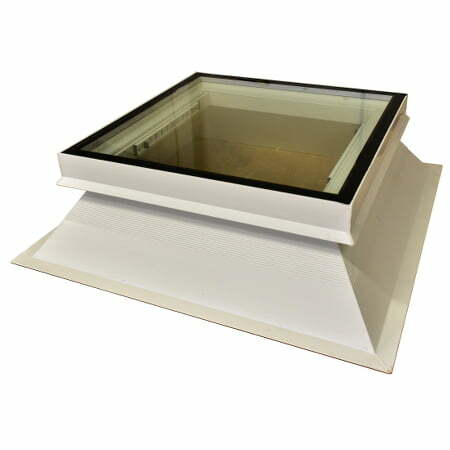 [short_description] => Our Duraglaze Plus rooflights are available as fixed (no ventilation), vented or hinged units. You can choose between manually or electrically operated opening. Manually operated units are supplied with a brass telescopic wormgear mechanism which is operated by an optional winding rod. Duraglaze Plus units are available in bespoke dimensions. Please contact the office directly on 01670 821166 for a bespoke dimension quotation. 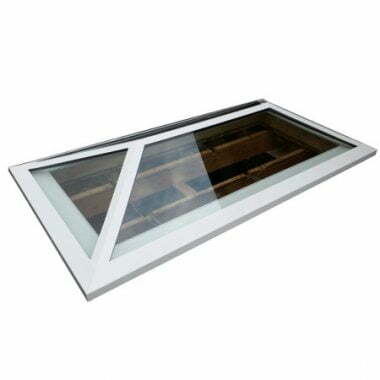 Our Duraglaze Plus rooflights are available as fixed (no ventilation), vented or hinged units. You can choose between manually or electrically operated opening. Duraglaze Plus units are available in bespoke dimensions. Please contact the office directly on 01670 821166 for a bespoke dimension quotation. Our Duraglaze Plus range is one of the most competitive Flush Glazed rooflight products on the market with the benefit of having a base kerb for direct fixing to roof level. The range offers a sleek modern design which is Part ‘L’ compliant. Extruded from high quality UPVC this range offers an integrated water management system to shed water to the outside of the rooflight. Internally the white UPVC provides a clean, smart self-finish.